RESIDENTS in the township of Tabubil, Western Province, are cowering in “horror and fear” after a week-old baby was eaten alive in front of a shell-shocked crowd, allegedly by the father. And the shocking act allegedly continued minutes later at Tabubil police station last Thursday in front of curious onlookers, including policemen and the town’s senior district court magistrate, Patrick Monouluk. An eyewitness who is employed by Ok Tedi Mining Limited told the Post-Courier that the town is on “red alert”, with residents taking precautionary measures. He claimed parents were restricting their children from going outdoors because of fears that they could also be targets. “This is the talk of the day on the streets here. All parent are fearing for the safety of their children because cannibals are on the loose here,” the source, who sought anonymity because of his employer’s media restrictions, claimed. 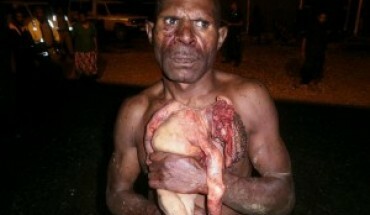 “Believe it or not I saw him eating the baby by piercing its body with his teeth while blood spilled from his mouth. Everybody watched him with fear.” Acting Western provincial police commander Peter Philip confirmed the horrific act. He said the man entered his home at Wanbin settlement at around 10pm and started an argument with his wife who was nursing the baby. Chief Insp Philip said after strangling the wife, he grabbed the child and started bitting its head, neck and bosom. “The child was crying in severe pain. The wife alerted neighbours who attempted unsuccessfully to take the baby from him because he was allegedly possessed by evil forces. Next Post:Europe hates Donald Trump. Does it matter?